For the record, I’ve never been able to dance. Doesn’t matter the style. But pretending to flail about as if it’s dancing is one of my hobbies! Also, HOW DOES A WORM CLOG I DON’T EVEN KNOW. Also also, ballet is the manliest of dance styles, and let no one tell you otherwise. 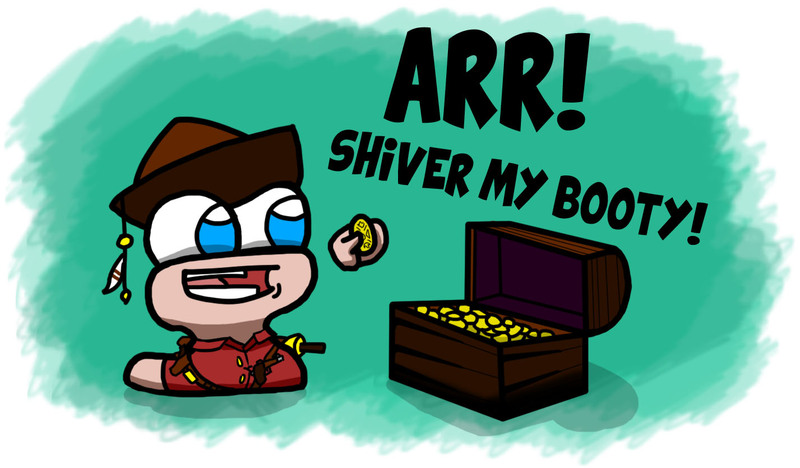 Holy moley, another character! Yes, his name is Flamm Vartagnan, and he is a flamingo and a bard. And my dream Dungeons and Dragons character! How in the world do you play a spoony flamingo bard? …that is an excellent question. My thinking: GO FOR ANY CAKE IN SIGHT. Here is my make-up work for missing Saturday and Sunday. 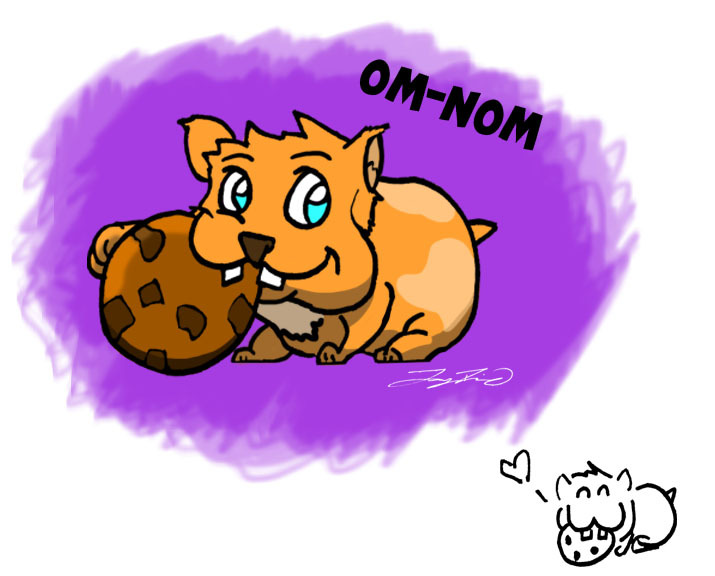 I hope you’ve had as great a day as a hamster does with a cookie. If not, have one tomorrow! 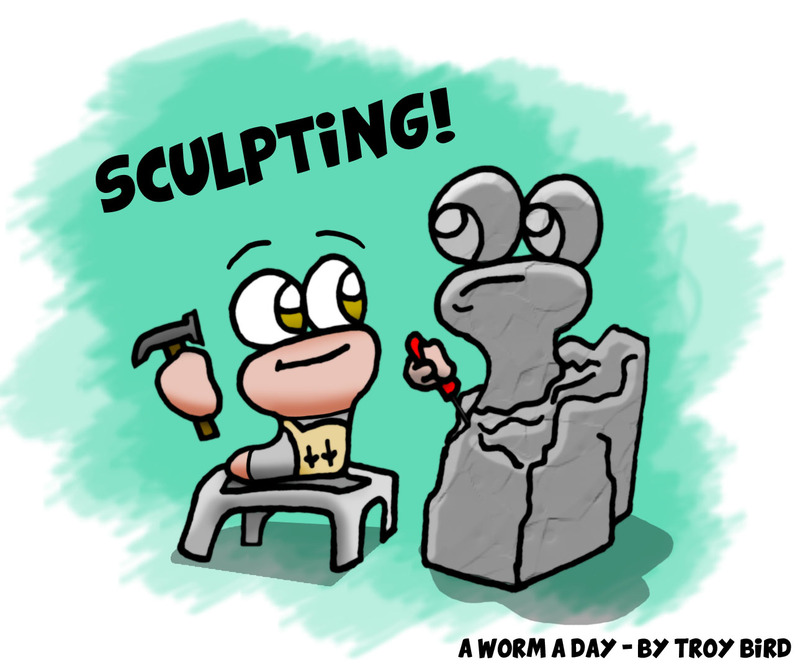 I know most sculptures don’t care how they’re made. Or have feelings. But I can’t help but imagine that this unsure look is the same my own plaster or clay projects would give to me. Oh well. Practice on hapless pieces of granite makes perfect! 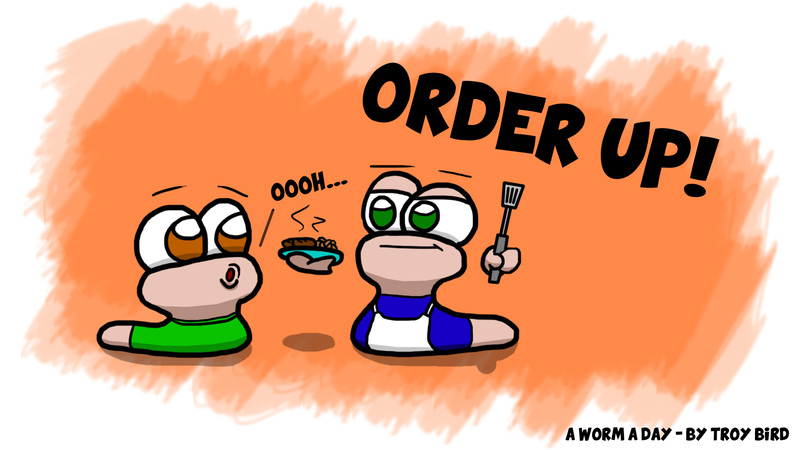 Yes, my worms have names! 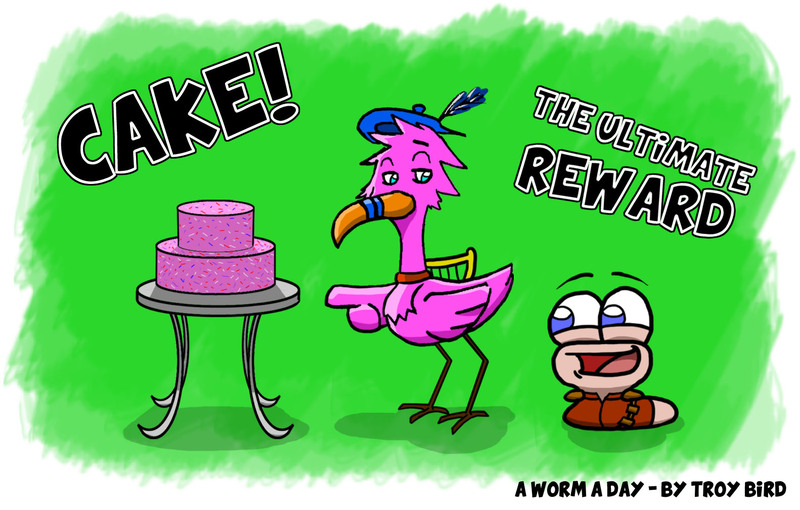 Ever played the game the Worms games by Team17? 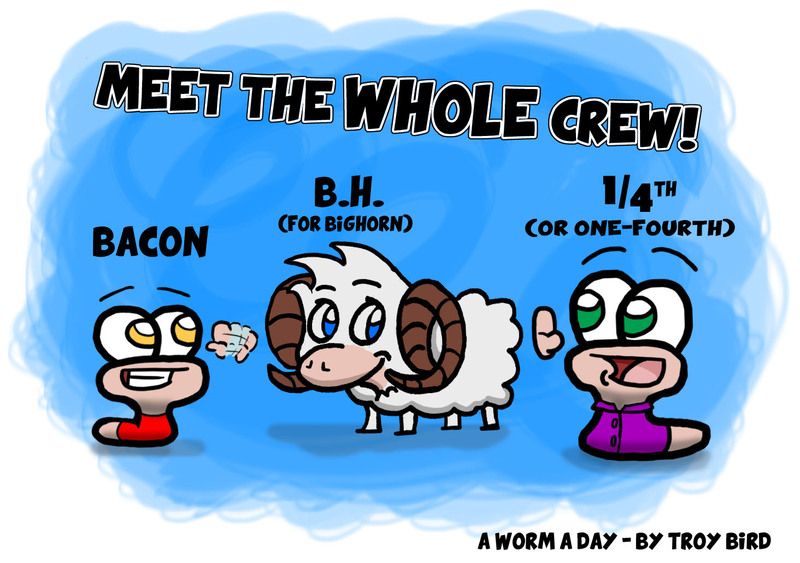 Then you’ll know where the worm names came from! Bacon is the young’un with big ol’ round eyes, and One-Fourth (yes, the fraction) is older and only slightly less mature. And is that… a new character? M’yes! His name is B.H. for Big Horn, mostly because I couldn’t name him after ‘Bighorn Sheep’ for obvious reasons. He doesn’t roll like that – he’s actually quite honest for a mountain-dwelling sheep. I’ve drawn these goofballs for years and years – I hope they make a good first impression! He may not be able to beat Superman in an all-out fight, but I think Goku is a better role model for kids. Here’s the bottom line: time and effort are the most important ingredients for greatness. 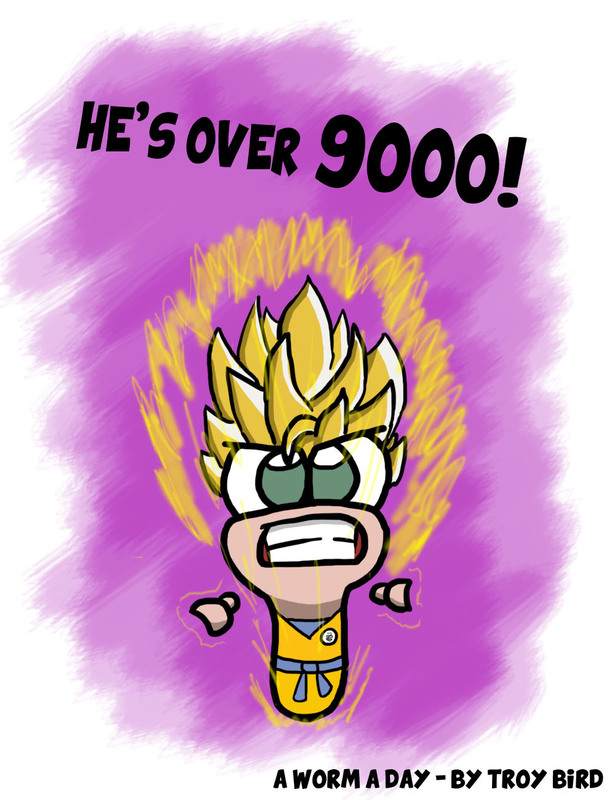 Most of us aren’t super saiyan from day one – it takes work! I don’t wanna brag or nuthin’, but my ‘stake-and-potatoes’ game is preeeeeeeety sweet. Pew! Pew pew! Sizzle pop! 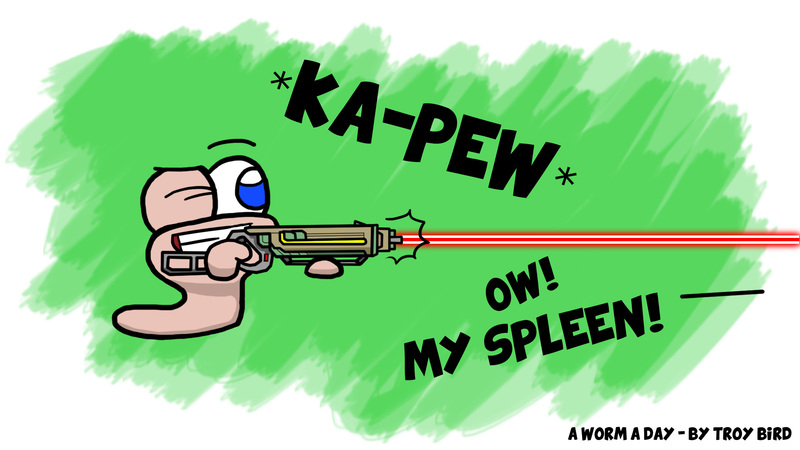 Gotta say, anytime a video game puts a laser rifle in my hands, the ‘pew pew’ is sure to follow. 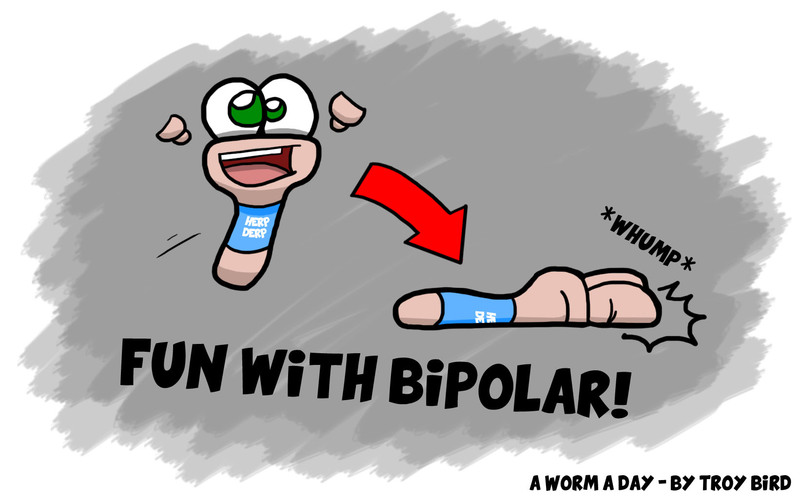 This week, I was diagnosed with bipolar disorder type two. So while I have more downs than ups, this is pretty much the rollercoaster that is mah life. All aboard the mania and depression train! 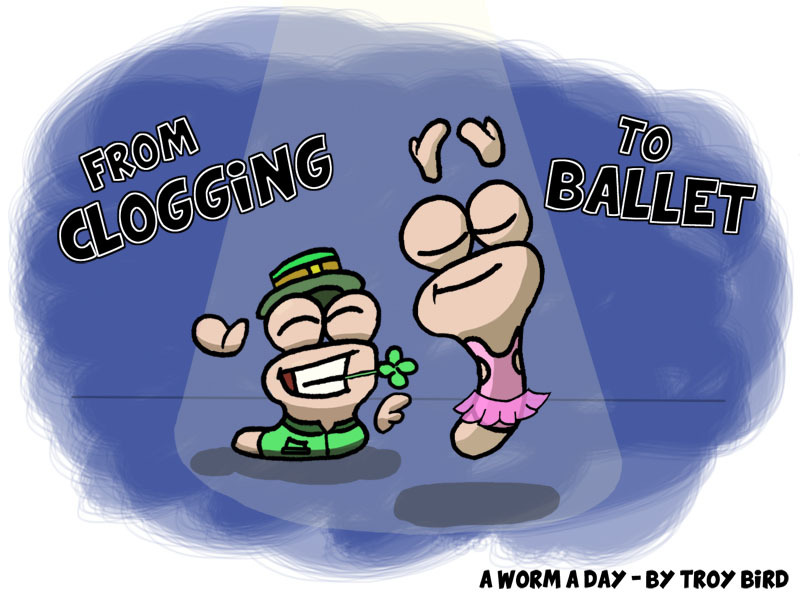 A Worm A Day is my attempt to give myself a daily project and some stability while I learn to deal with this condition the right way. I’m not looking for consolation or anything – in fact, if I can help anyone going through something similar and put a smile on their face, then I’m happy. Okay, maybe don’t do that. You might be frowned upon. But hey, if you do, make sure you have the biggest and best booty around!